NFPA 25 – the Standard for the Inspection, Testing, and Maintenance of Water-Based Fire Protection Systems provides an excellent guide as to what equipment needs to be tested, and how frequently. And very often, the property or building owner hires the right person — licensed and qualified — to run the fire pump through its proper test. 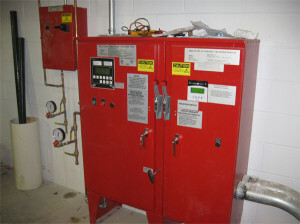 But if you are not careful, it is easy for someone to simply press a start button to test the operation of a fire pump, and in so doing forget or neglect to test the automatic starting of the fire pump. Yes, it’s good to see the pump running, and to visually inspect the equipment operation and likewise make necessary adjustments as needed. So, starting the pump manually is a very easy step in this process. But if there is ever a need for the fire pump to start on its own, with no one around, will there be a person in the mechanical room ready to press a button? Probably not. Regarding regular testing of fire pumps, NFPA 25 (2014) 8.3.2.2. clearly and simply states “the test shall be conducted by starting the pump automatically.” In my opinion, missing in this statement is bold type, an underline, and at least two exclamation points. Whether you are testing weekly or monthly, there is no more important sentence in the entire standard. In fact, I would argue that this sentence is in essence the entire reason for testing regularly in the first place. But it is often not done, leaving a potential unknown hidden danger. To accomplish this automatic testing you need to simulate what actually happens in the event of a fire, and that is to drop pressure in the controller sensing line. By doing this, you not only get to witness the operation of the equipment, but you see how it functions in the most crucial moment — that is, how it starts in the face of a system pressure drop. Pressing the ‘start’ button doesn’t do this! The specific method of simulating automatic starting varies with each fire pump installation, but the easiest method is to utilize a proper sensing line arrangement and slowly drain the water off of the controller sensing line. See attached picture (courtesy of Metron, Inc.), where each sensing line contains a port for a system gauge, as well as a drain port to bleed off water pressure. Again, such testing should be done by qualified individuals who have been trained in the proper operation of the equipment, and who follow all procedures as outlined in NFPA 25. Other methods are allowed — such as using a timed solenoid valve or by using a safety relief valve — the net effect is the same: you get to witness the successful automatic starting of the equipment. If there are problems — NOW is the time to know about it, so that necessary corrective action can take place. Without performing the automatic start test, the biggest problem you may have (in fact, the worst-case scenario) is one that no one even knows exists. So, whether it’s weekly testing or monthly testing, place the word “automatic” before the word “testing.” It is too important to miss.